The mural is a tribute to the lives and music of San Antonio-based musicians. 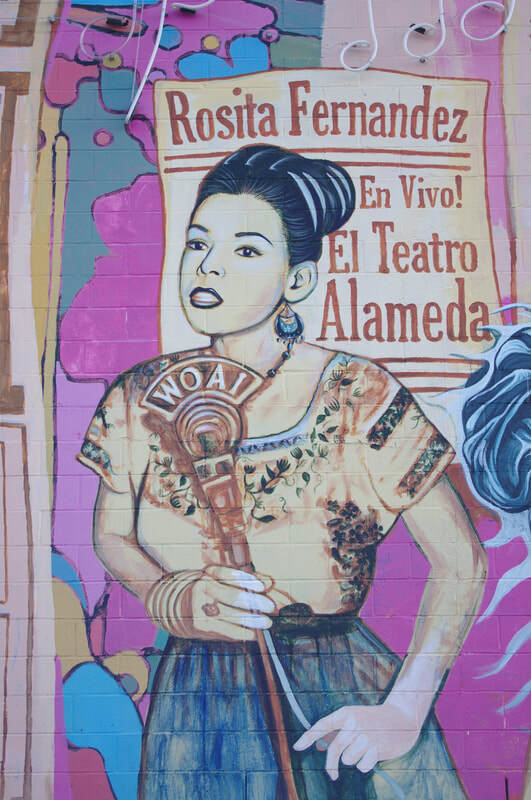 San Anto Cultural Arts founder Manny Castillo always wanted to have murals on West Commerce Street and Guadalupe Street, the gateways to the Westside. La Musica de San Anto is the first of these gateway murals. 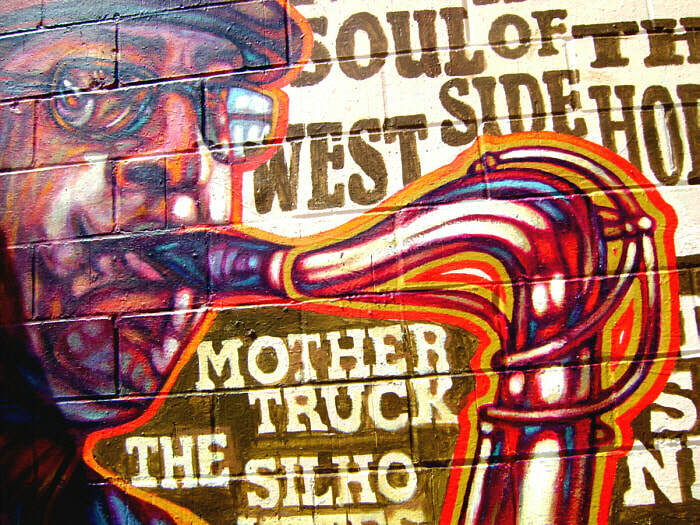 Designed to show San Anto musicians from different decades in the same jam session, the mural also includes playbills and references to classic San Antonio music venues. 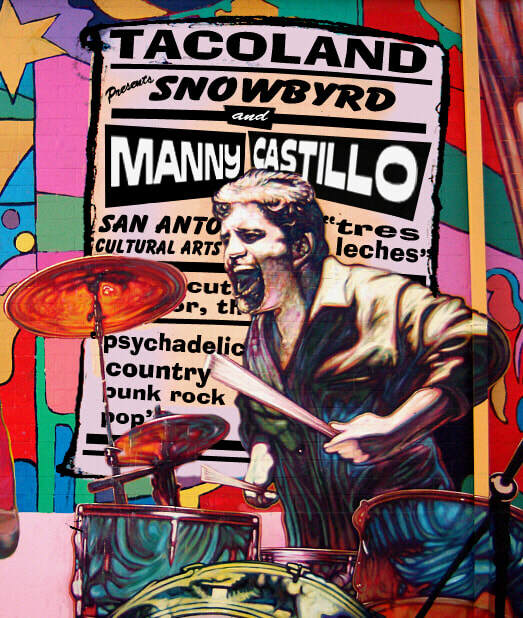 Castillo passed away suddenly while this mural was still in process so the artists painted him into the center of the mural, commemorating Manny as both a passionate punk-rock musician and a Westside community leader. Blancas found his artistic style challenged by the public nature of mural projects. Because the wall measures 141 x 17.5 square feet, Blancas relied on the support of other artists to complete the project. As a community arts organization, San Anto Cultural Arts frequently sent Blancas large groups of volunteers, many of them kids with no painting experience. To keep the mural cohesive and visually appealing, Blancas decided on two techniques: a simple background and a small color palette. The background of La Musica de San Anto is a jigsaw of solid-color abstract shapes that the artists projected and traced onto the wall. Inexperienced volunteers could fill in the color blocks. Sometimes Blancas found himself wiping drips of color of a portrait’s nose but for the most part, the color-blocking strategy was successful. For the color palette, Blancas picked cadmium red, cadmium yellow, ultramarine blue, thalo blue, cadmium orange, white, yellow ochre, dark green, and magenta. Using a consistent and limited palette created visual continuity across the mural. Since La Música de San Anto, Blancas continues to paint with this pallet, producing varied works of art with the same seven colors. Blancas compiled the portraits to make the musicians look like they were all playing in the same jam session. 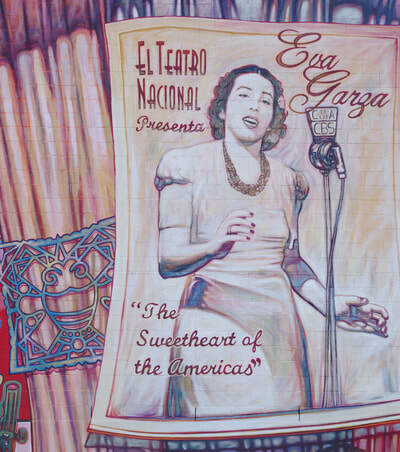 The exception is Eva Garza, who was famous in the 1940s and is the oldest person featured in the mural. Her photograph is painted onto a Dia de los Muertos altar, above ofrendas of velas and guitar-strumming calaveras. David Blancas and his colleague Juan Gonzales carefully selected the fonts and typography on the playbills to evoke each musician’s peak era, whether it was the 1940s or 1970s. Lead artist David Blancas describes La Música de San Anto as a documentary project, meant to represent and preserve the legacies of influential San Antonio musicians. 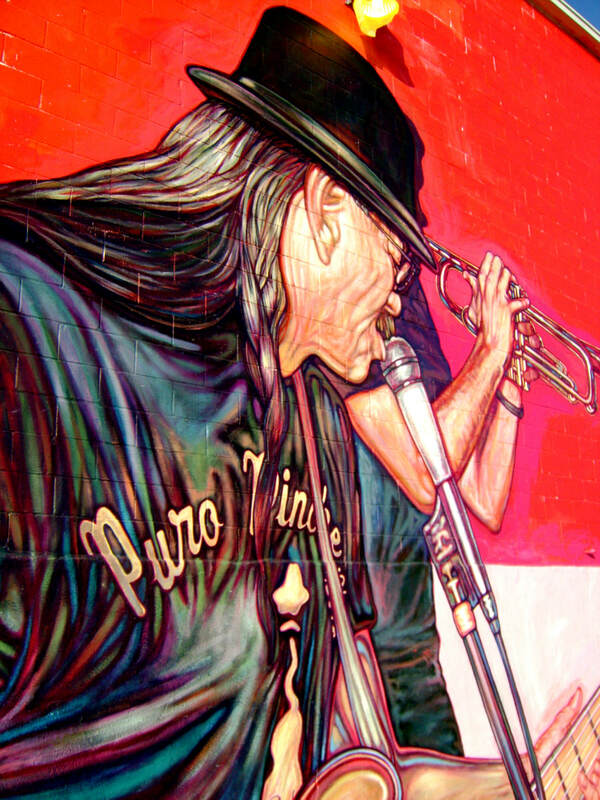 Instead of following San Anto’s typical community process, Blancas met with the surviving family members of each musician featured on the mural. He listened to them tell stories about their loved ones and collected copies of family photos as reference images for the mural. Based on these images, Blancas drew portraits of each musician and made a composite sketch for the mural. He recruited his friend Juan Gonzales to design playbills for each musician in Adobe Photoshop. The playbills incorporate what Blancas learned in interviews to provide context for each artist. Once the musicians’ family members approved the design, Blancas and his crew moved on-site. Before painting, the crew drew the background, playbills, and portraits onto the wall. During the evenings, Blancas projected the mural design onto the wall so that artists could trace the outline. The piece was highly collaborative, with Adriana Garcia, Christian Rodriguez, Gerry Garcia, Cardee Garcia, and David Blancas each taking charge of different sections of the wall. As the lead artist, Blancas worked the most hours, painting Manny Castillo, Eva Garza, Randy Garibay, Clifford Scott, and Rocky Morales. Christian Rodriguez painted Felix Mendoza and the rest of the figures were painted by various assistant artists. La Música de San Anto was held up several times because of turmoil and tragedy at San Anto Cultural Arts. In 2008, San Anto’s founder Manny Castillo began to complain of a cough. In October of 2008, he was diagnosed with cancer but kept the diagnosis private. 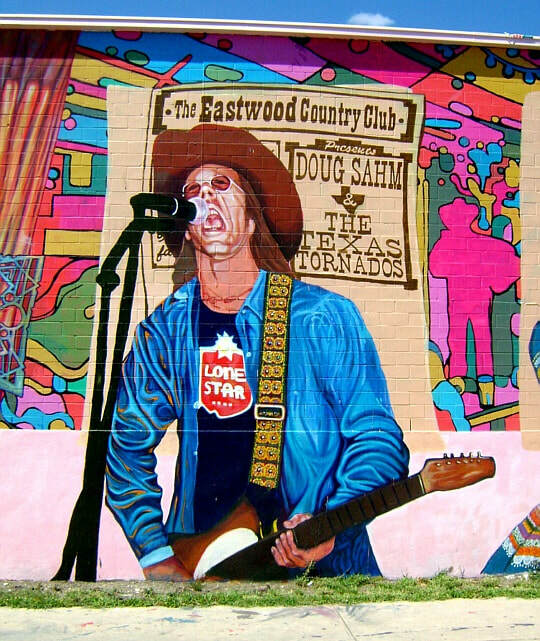 Although concerned, the artists and other members of the San Anto community assumed he was fighting allergies or the flu. 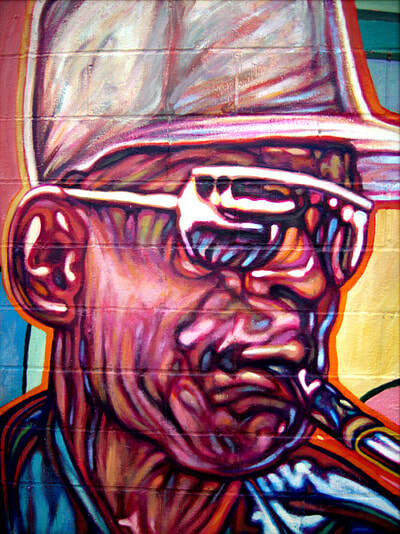 Manny even visited the mural site to check on the artists and continued to play the drums in live music performances. Then suddenly, in January 2009, he passed away. David Blancas immediately knew he wanted to include Manny in the mural. Even though Christian had just finished painting Felix Mendoza, he agreed to repaint the figure 15 feet to the left to make room for Manny’s portrait and drum kit. 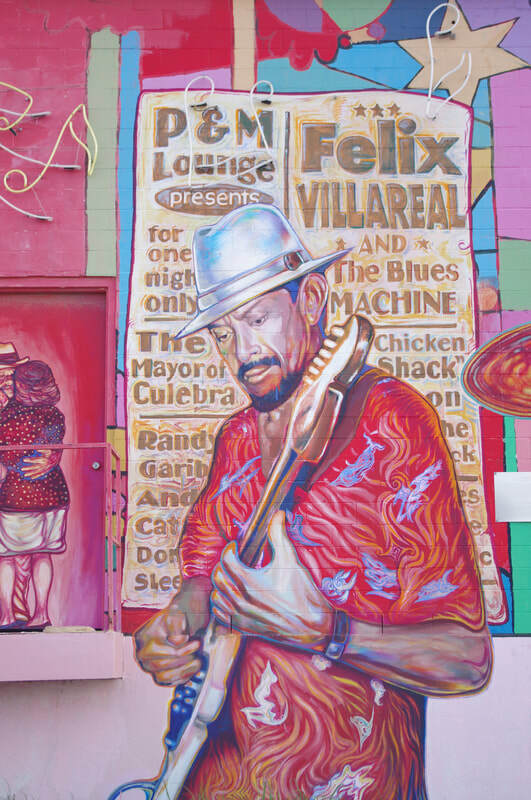 The painting and blessing of La Musica became a celebration not only of Manny’s role at San Anto, but of his influence on the local music scene. David added neon lights to the mural as a special touch to honor Manny, fondly remembering how he never interfered but empowered artists to realize their vision in each mural. Some parts of the mural are still unfinished. Blancas and Adriana Garcia were painting up until the day before the mural dedication. That evening, it began to rain. The artists had to clean up paint drippings caused by the rain and call it quits. Valerio Longoria is unfinished, and Lydia Mendoza is still in black and white. Still, the mural dedication was a powerful experience. Doug Sahm performed live, and so did many of the sons and surviving bandmates of the featured musicians. Manny Castillo had always hoped to post murals at every entrance to the West Side. 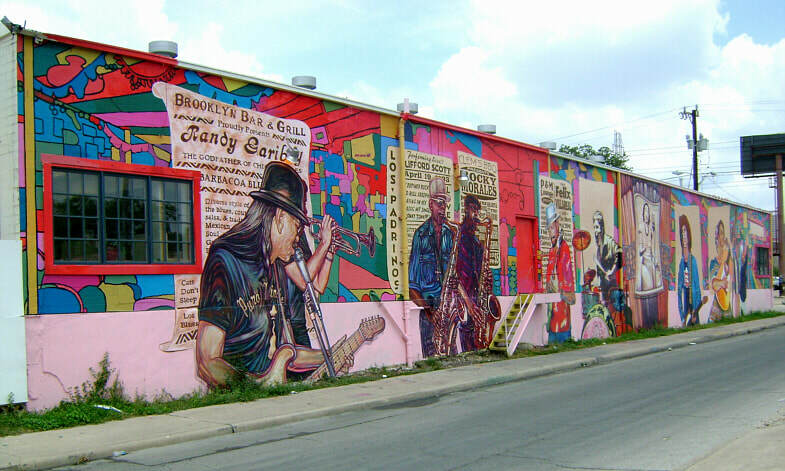 La Musica de San Anto guards the West Commerce entrance, with local music legends and Castillo himself serenading every car that enters the Westside. 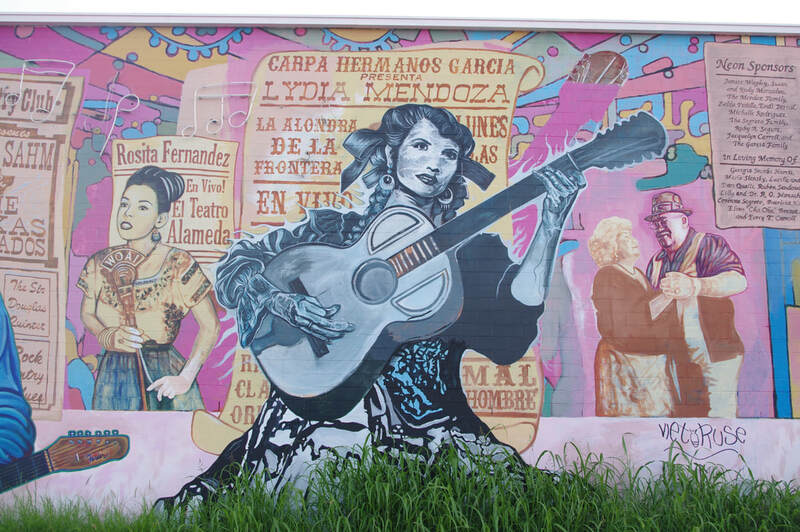 David Blancas became involved with San Anto Cultural Arts by volunteering on several mural projects, including Adriana Garcia’s Brighter Days and the restoration of Rigoberto Luna’s Insomne de Amor. He lead the gargantuan mural La Musica de San Anto, documenting influential musicians on the Westside. David has completed many other studio projects, fellowships, and public art pieces, as owning and operating Pintura Artwork Company. Read David Blancas’ full bio on his website.